Wolfie is a playful little pup, at currently only 10 weeks old she is a typical puppy and loves everything and everyone, and particularly loves getting into mischief! Wolfie is proving to be a very intelligent pup, she has already learned to sit and is walking well with good recall. She has also been very easy to housetrain and responds well to new experiences. Wolfie is ideally looking for an active family home and she will be fine with older children. 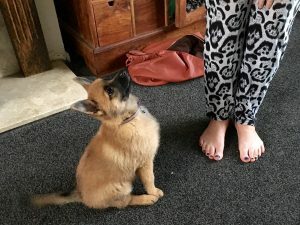 We are looking for an experienced home where she can have formal puppy training to keep her well socialised, teach her commands, and keep her intelligent little brain busy. As Wolfie is still a young puppy she will be adopted on the understanding that she returns to our vet practice to be neutered once she is old enough. She will be fully vaccinated, microchipped, flea and worm treated, and is currently being fostered in Deal, Kent.